According to Julia Child, French chefs, and traditional foodies, the absolute best chicken stock that can be made includes chicken feet. It, supposedly, adds a depth of flavor and a huge amount of gelatin (for superior stocks) that footless stocks just can't match. You can't exactly waltz down to the grocery store and come back with chicken feet, though. So I'll admit it... the awful truth... ever since I saw Julia Child make her stock with chicken feet I've been waiting for one of my laying hens to die. Rather than one of the cannibal biddies, though, unfortunately the first one to bite the dust was Howard. You may remember our Polish Crested rooster from this post. He was a cocky little crower, but he crowed his last earlier this week when he was run over by the moving coop. RIP Howard. My husband did the thankless task of plucking and gutting, and brought Howard home for me to stew... feet included. Let me tell you... nothing I read about the delights of French cooking prepared me for the NIGHTMARISH experience of actually skinning chicken feet!!! The how-to is easy enough. You boil the feet for about 1 or 2 minutes and then plunge them into cold water. Supposedly the skin slips off just like on a tomato. BUT THEY FAILED TO MENTION THAT IT GETS CAUGHT ON THE TOENAILS! EEEEEEWW!!!!! I called my father for moral support. I was so grateful that he didn't laugh at me when I told him I was skinning chicken feet. He held my hand over the phone and without him I don't think I could have done it. Those, dear ladies, are Howard's skinned feet (stewed for 24 hours). 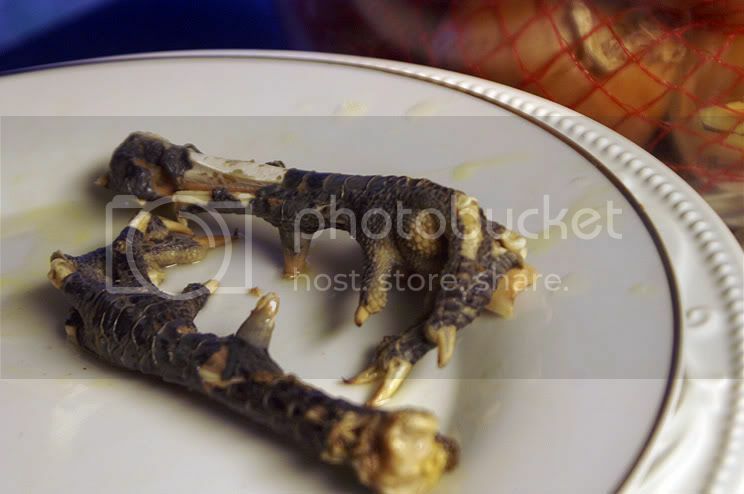 I don't think any soup on earth could be worth the horror of peeling a chicken foot and having the claw come back to clench your finger as you drop its snake-like shedded skin. This soup had darned better be worth it. Farm life initiation lesson 436: complete. I'm cringing as I read this! Ew. Plucking chickens is bad. The feet though - can't do it. Our local grocery has chicken feet , and I tell you my experience was similar but fleshy pink feet are better than those black feet ick. I'm sure the taste is all the same , oh and it is worth the effort. I'd be more amazing if I hadn't almost fainted three times during the process ;). Oh. Aren't those....interesting. And such an elegant presentation. You certainly don't shy away from new experiences , do you? I used to work on a ferry and the galley was manned almost exclusively by Chinese cooks. 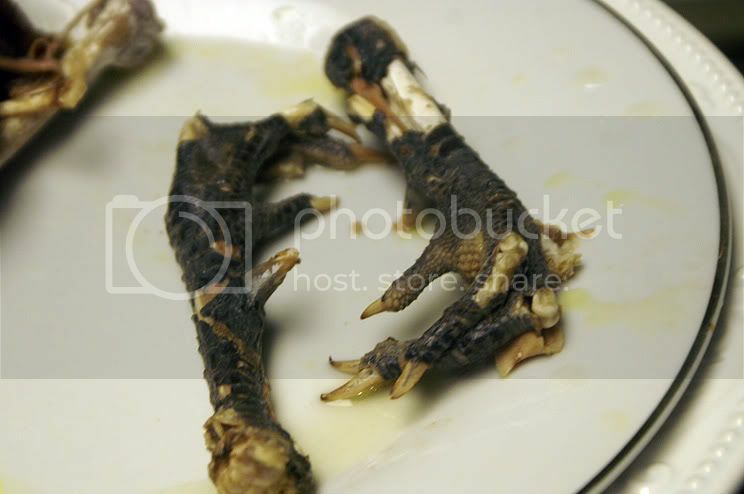 When they made their own meals they used chicken feet a lot. They would deliberately manipulate them to make the claws grasp at the newest waitresses to make them run and shriek. I don't know if I could do this, but those guys made some incredibly good food! lol...yeah, although technically you're supposed to skin and de-claw chicken feet, you'd better believe I'm WAY too lazy and squeamish for all that...so the closest I ever get to them is fishing them out with the kitchen tongs when the stock is done :P Although leaving the skin on really makes them look like dead baby fingers--with CLAWS--after they've boiled 18 hours. Gag. Yes, absolutely gross. Your visual makes it even more so - if I have nightmares tonight it will be your fault. 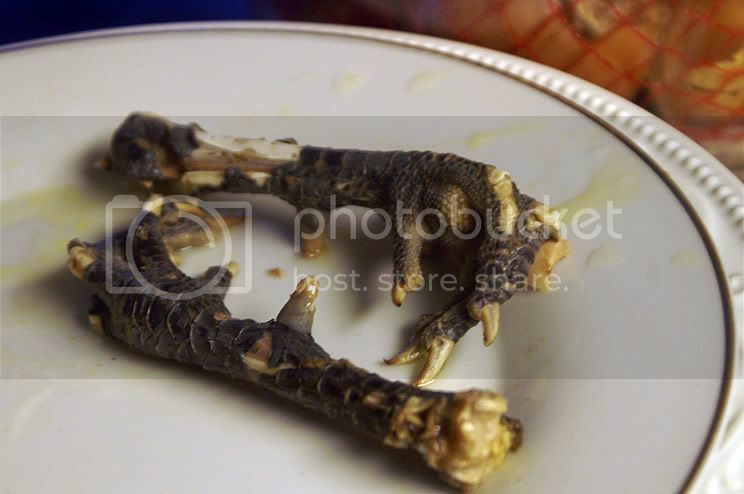 (Just saying) Any time I hear "chicken feet" I can only think of the Indonesian lady who recommended it to my sister as a cure for infertility. She didn't try it. Well, the poop on the feet is why you skin them before putting them into your stock :). I must admit it was a superior stock... but I'm still squirming from the process! EEEEEW! Yes, this is gross no matter how you do it. I didn't actually touch the feet with my fingers. I kept a nice safe distance by handling them with napkins ;)... that millimeter of protection did wonders for my psyche throughout the process. I wonder how on earth chicken feet could help infertility? Maybe I'll take chicken stock with chicken feet daily ;). I just peeled chicken feet (20 of them!) for the first time last night. It was one of the grossest things I have ever done, and I agree, that stock better be darned good! Chicken feet are delicious! And loaded with collagen. Indeed they are! But disgusting to cook, nonetheless ;). I'm so sorry! I guess they forgot to tell you to snip off the talons. Everything I've read about chicken feet reccomends that. I'm wating to get my hands on a whole chicken. Golly that would've been good to know!! :) They seemed to fall off after I cooked them long enough (in the stock), so taking 'em off before peeling would've most assuredly helped. I'll remember that next time we butcher!